Most people will agree – the original price of the Lapdock for the AT&T Motorola ATRIX 4G was way too high. A few weeks ago we reported a sale that would enable you to get your hands on this accessory for a mere $55 after shipping. If you missed out on that one, we have good news for you. 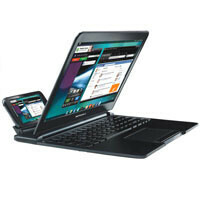 1 Sale a Day has put the AT&T Motorola ATRIX 4G Laptop on sale again. This time it is running a Buy It Now special through eBay for $59.99 with free shipping. Even through it is $5 more this time around; it is still a great deal for ATRIX owners. The Lapdock features 1 GB RAM, 11.6” screen, full keyboard, touchpad, stereo speakers, and two USB ports. It weights 2.4 pounds and has a 3 cell battery that provides up to 8 hours of use per charge. There are only limited quantities available, so if you’re in the market for a Lapdock, hurry over to eBay to catch this deal. Yea I seen a video of it and was amazed how different and better it was.